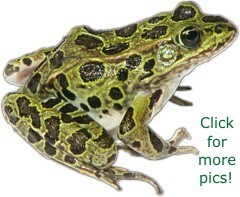 Refer to the Basic Biology page for some general information about frogs and toads. 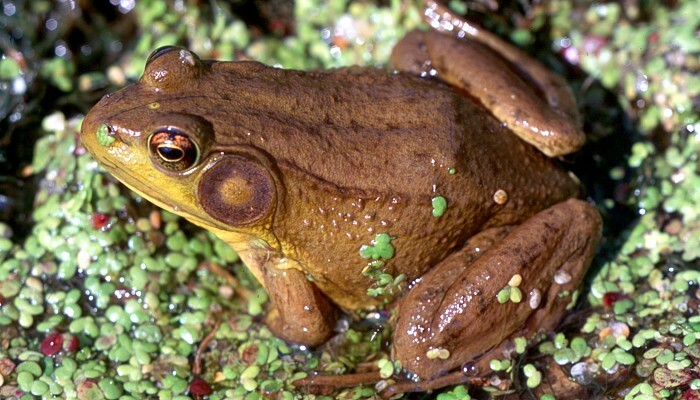 The genus: "Rana" no longer is used for any of Manitoba's members of the Ranidae, they are now included in the genus: "Lithobates". "Litho" means stone. "bates" refers to something that walks or creeps, so these are the "walking stone" frogs! 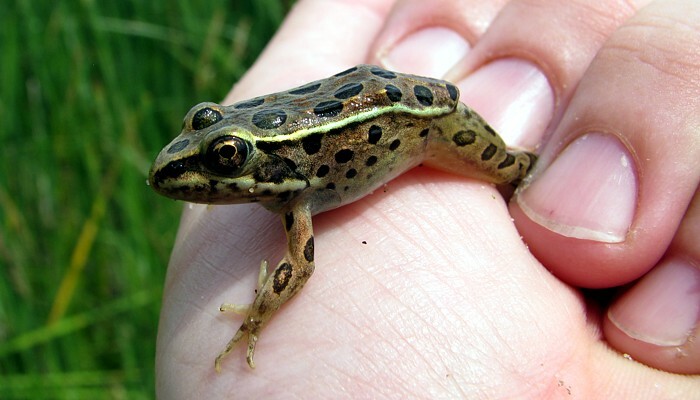 In the early 1970's Manitoba used to export 50,000 kg of Leopard Frogs each year (over 1 million frogs), mostly for use in the scientific dissection trade. 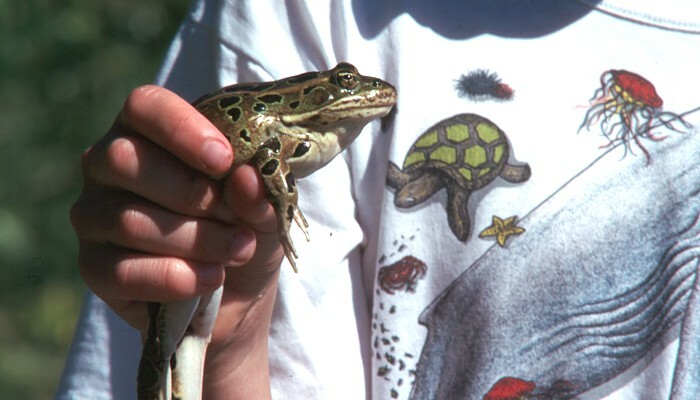 In the 1970's a disease swept through Manitoba nearly wiping out Leopard Frogs. Though numbers have recovered there is no longer any commercial collecting. 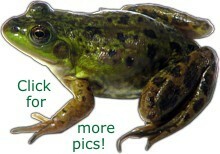 There are 4 species of true frogs (Family: Ranidae) found in Manitoba. 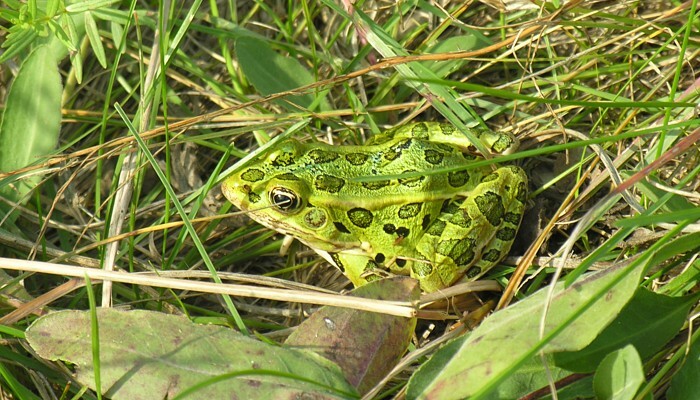 Two, the Leopard Frog and Wood Frog, are very widespread and common, while the other two, the Mink Frog and Green Frog, are restricted to the southeastern part of the province. There are few records for the latter two in Manitoba, so they are of particular interest to this project. Current conservation rankings by the Manitoba Conservation Data Centre are included here. For explanations of the ranking terminology: Click Here. 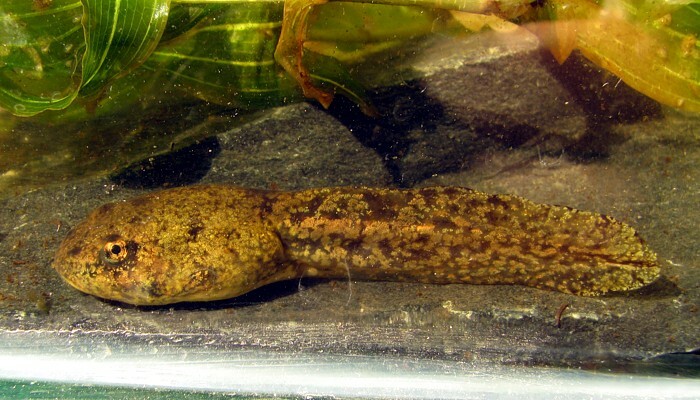 Description: A large frog, up to 10 cm body length. Variable in colour, green to tan with scattered small black spots. The belly is white. The tympanum (ear drum) is prominent. 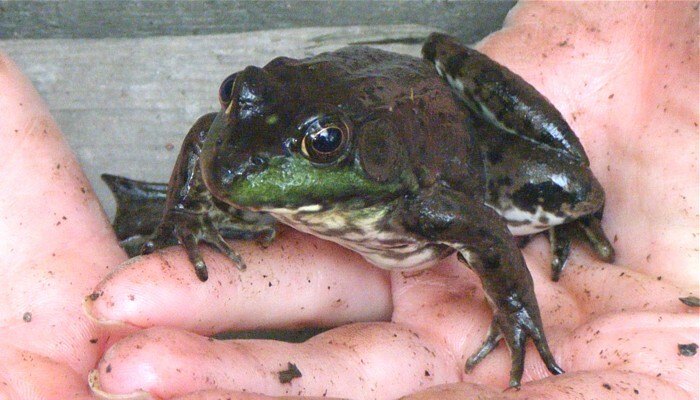 Bright green colour on the upper jaw and dark transverse striping on the hind legs distinguish this species from the Mink Frog. Habitat: Small lakes, large ponds or slow moving streams and rivers in the boreal region of southeast Manitoba. Adults are largely aquatic and rarely found far from water. 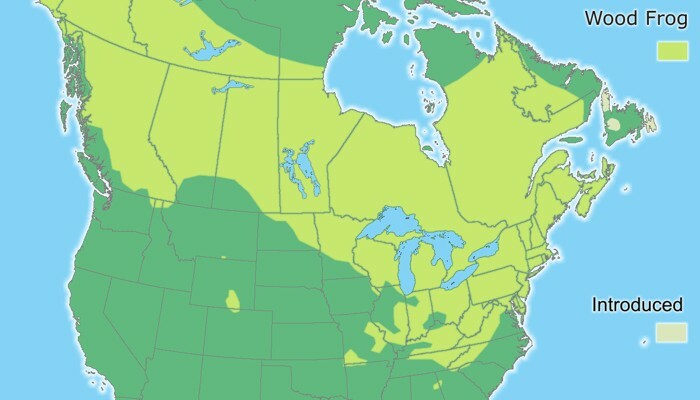 Status and Range in Manitoba: The Green Frog is considered rare (S1/S2) in the province, largely because of its limited range and low numbers of records. It has only been found in a small region of SE Manitoba. Most records are from Nopiming Provincial Park. It occurs near Kenora, Ontario, so there's a chance it may occur in Whiteshell Provincial Park or in the region down to Buffalo Point. It may also occur north of Nopiming Park, but it is unlikely that it's found west of Lake Winnipeg. Current Range Map for the Green Frog. Life Cycle: Males set up territories and call for mates in late June through July. Calling males will be spread out, not bunched together. Eggs are laid in July, in the aquatic habitat where the adults live, and will hatch in a few days. 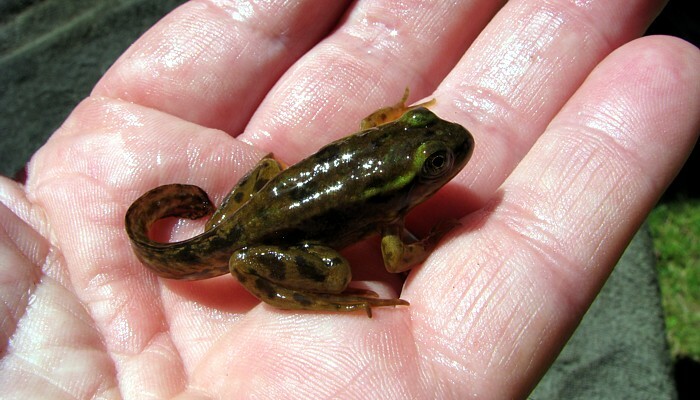 Larvae of Green Frogs are distasteful to fish and other predators. Larvae grow to a large size (10 cm or more, total length), spending their fist winter as larvae, then transforming the following summer, usually in July or August. Hear the Green Frog mating call: Your browser does not support the audio element. Tips on finding this species: Listen for males calling from late June to early August. The best time to hear them is evening or early in the morning, but they may call throughout the day. Your best chance of seeing a Green Frog is scanning the edge of water bodies. Description: A large frog, up to 10 cm body length. Colour green to khaki, with many large dark spots. The belly is white. Tympanum (ear drum) is less prominent than in Green or Mink frogs. Habitat: Edges of wetlands to moist grasslands and forests. Can be found far from wetlands in summer. 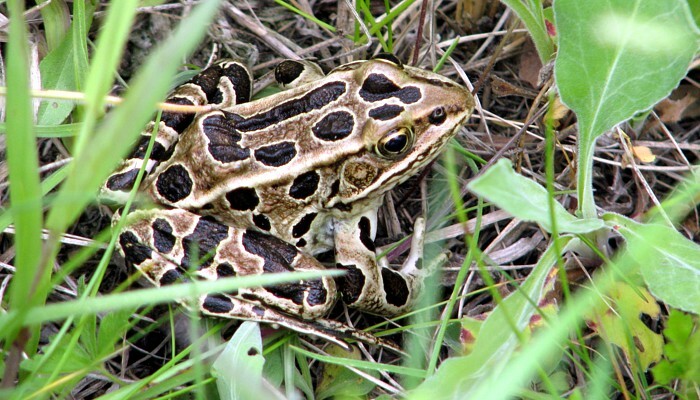 Status and Range in Manitoba: The Northern Leopard Frog is widespread and abundant in Manitoba (S4). It occurs throughout the southern 2/3's of the province. Current range map for the Northern Leopard Frog. 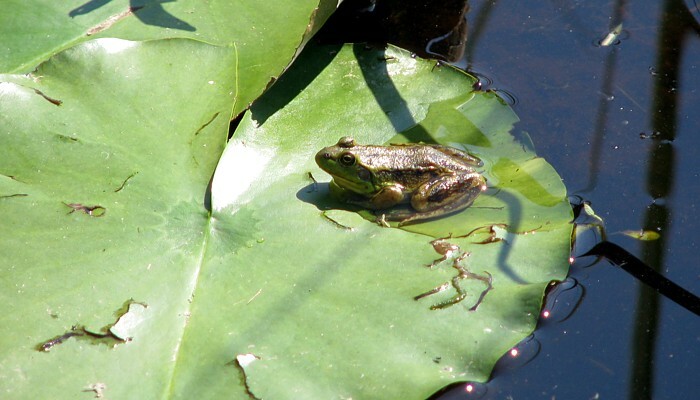 Life Cycle: Leopard Frogs breed in small water bodies: snow melt ponds, marshes, small streams and lagoons of larger lakes. In southern Manitoba adults move to breeding sites early in spring. Males call from late April to mid-May, mating is usually complete by mid-May. 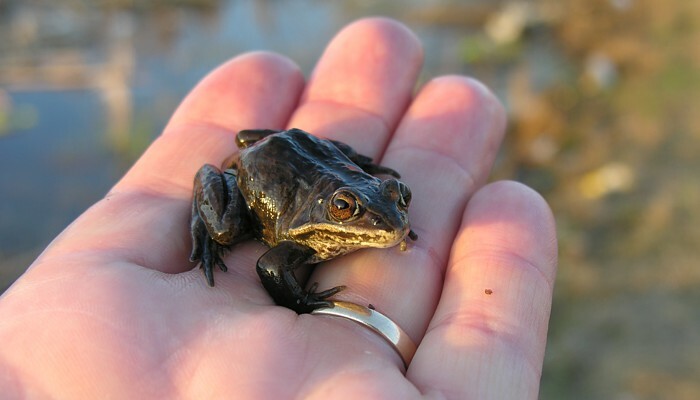 Transformation to froglets occurs in about 10 weeks, usually around the end of July. 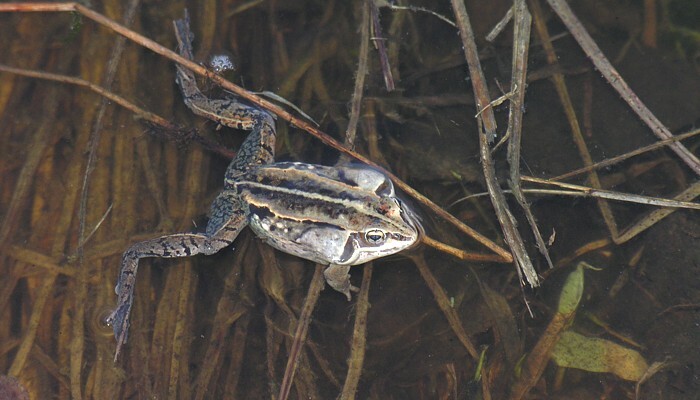 Hear the Leopard Frog mating call: Your browser does not support the audio element. Tips on finding this species: Listen for calling males from late April to mid-May in southern Manitoba. Evening, from dusk to full darkness, is the best time to hear them, but they will call during the day as well. 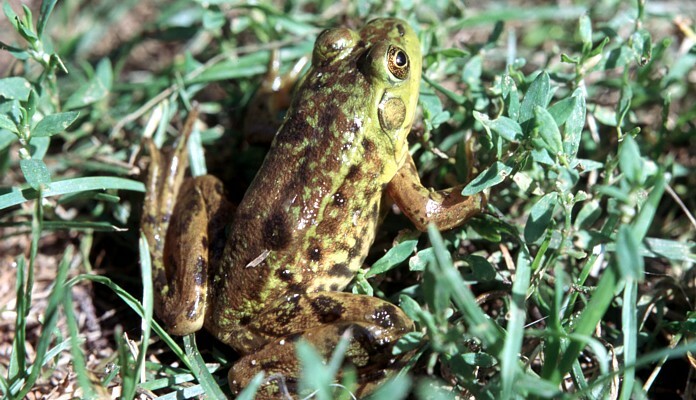 Leopard Frogs are commonly seen near wetlands and in grasslands or forests near wetlands. Description: A large frog, up to 8 cm body length. Colour variable, green to light brown with scattered dark blotches or spots. The belly is white. The tympanum (ear drum) is prominent. 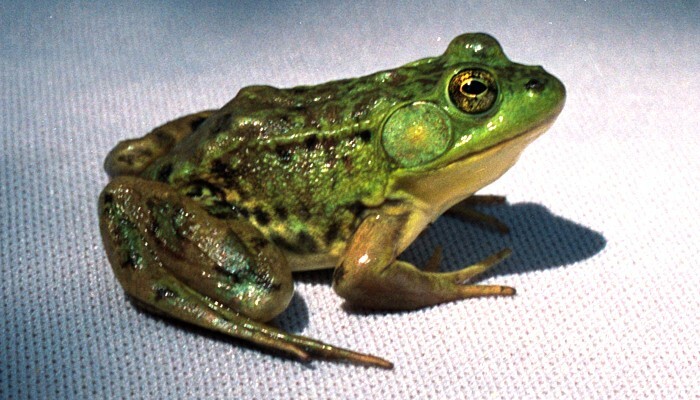 Dark patches on the hind legs do not form transverse stripes, distinguishing it from the Green Frog. (It can be difficult to tell these two species apart visually, so take careful note and take a picture!) When handled this species emits a pungent mink-like smell -- think of rotten onions --, hence its name. Habitat: Small lakes, large ponds or slow moving streams and rivers in the boreal region of southeastern Manitoba. Adults are largely aquatic and rarely found far from water. They are often found in association with water lilies. 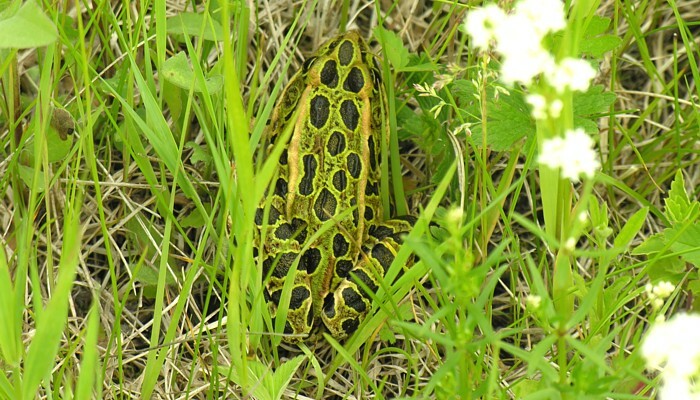 Status and Range in Manitoba: The Mink Frog is considered uncommon (S3) in the province. It has only been found in a small region of southeastern Manitoba. It is common in Whiteshell and Nopiming Provincial Parks, but might be found down to Buffalo Point. It may also occur north of Nopiming Park, but it is unlikely that it's found west of Lake Winnipeg. Current Range Map for the Mink Frog. Life Cycle: Similar to the Green Frog. Males call for mates from late June through July. Calling males will be spread out, not bunched together. 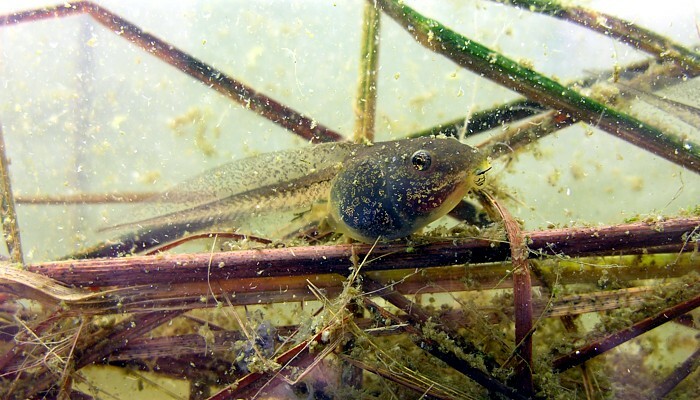 Eggs are laid in July, in the aquatic habitat where the adults live, and will hatch in a few days. 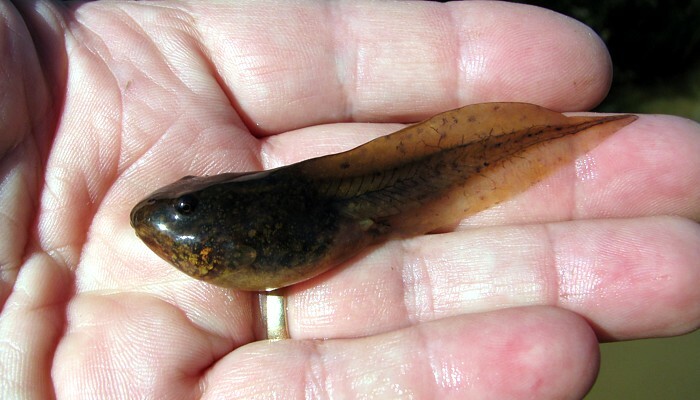 Larvae of Mink Frogs are distasteful to fish and other predators. Larvae grow to a large size (10 cm or more, total length), spending their fist winter as larvae, then transforming the following summer, usually in July or August. Hear the Mink Frog mating call: Your browser does not support the audio element. Tips on finding this species: Listen for males calling from late June to early August. The best time to hear them is evening or early in the morning, but they may call throughout the day. 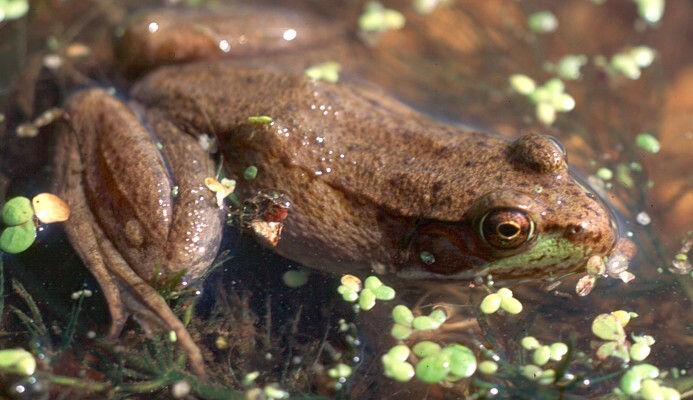 Your best chance of seeing a Mink Frog is scanning the edge of water bodies. They often sit on water lily pads or other floating vegetation. 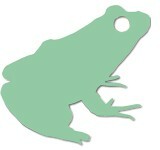 Description: A medium-sized frog, up to 5 cm body length. Colour dark brown to light tan. Females are often a rusty brown. The belly is white. Tympanum (ear drum) is not prominent. A triangular darker brown patch extends from the base of the upper jaw to the eye. Habitat: Various forest types, marshes and even grasslands. Doesn't require permanent water bodies so can be found almost anywhere. 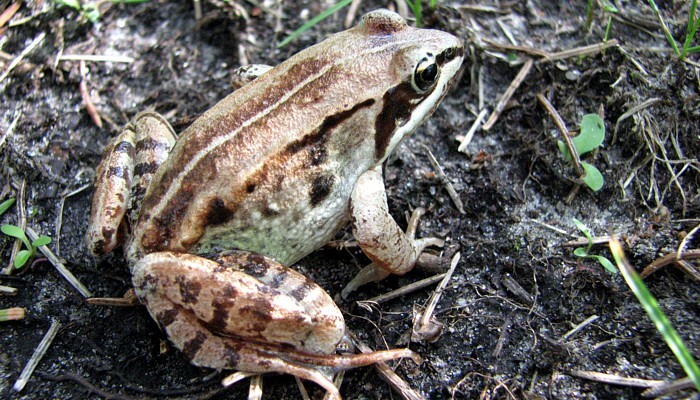 Status and Range in Manitoba: The Wood Frog is widespread and abundant throughout the entire province (S5). Current range map for the Wood Frog. 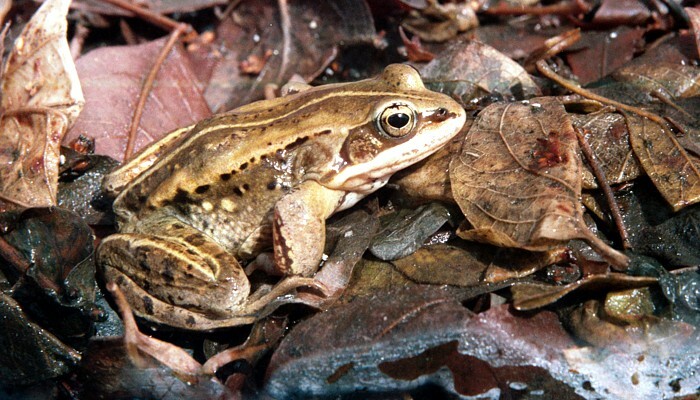 Life Cycle: Wood Frogs will breed in almost any small water body, but prefer temporary snow-melt pools. 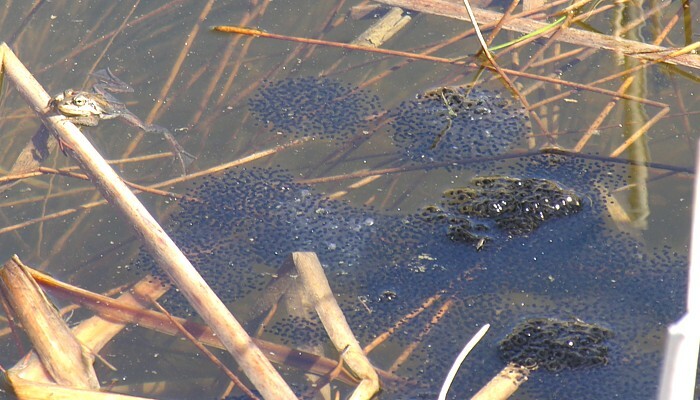 In southern Manitoba adults congregate at breeding sites early in spring. Males call from mid-April to mid-May, mating is usually complete by early May. 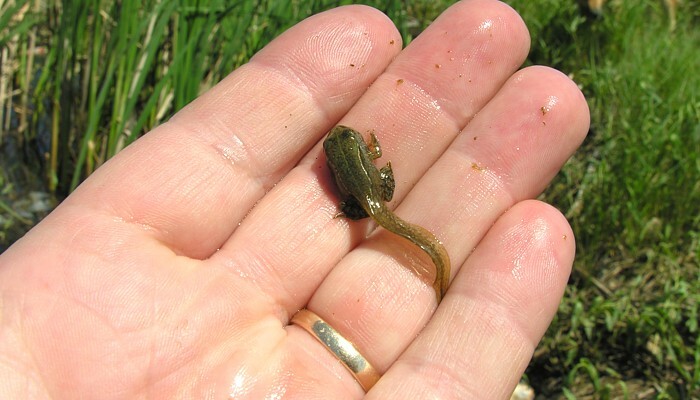 Transformation to froglets occurs in about 8 weeks, as early as late June. 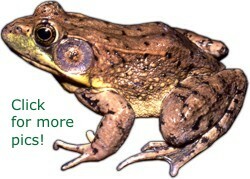 Hear the Wood Frog mating call: Your browser does not support the audio element. Tips on finding this species: Listen for calling males from mid-April to mid-May in southern Manitoba. Evening, from dusk to full darkness, is the best time to hear them, but early in the breeding season they will call during the day, too. Wood Frogs are commonly seen in any moist upland habitat.